Mental Disorders; Children; Adolescents; Outpatient Care. Objectives: Psychiatric disorders are increasingly recognized among children and adolescents in Bangladesh. Psychiatric disorders are more common in children with chronic and acute pediatric disorders. Our study was designed to determine the psychiatric disorders among children and adolescents attending pediatric outpatient departments of tertiary care hospitals. Methods: This cross-sectional study was carried out from July 2012 to February 2013 in pediatric outpatient departments of three prime tertiary level hospitals of Dhaka, Bangladesh. A purposive sampling technique was used. A total of 240 male and female children aged 5 to 16 years old were included in the study. We used a semi-structured questionnaire to obtain sociodemographic and other relevant clinical information about the children and their families from their parents or caregivers and a validated parent version of the Bangla Development and Well-Being Assessment (DAWBA) for measuring psychopathology. Results: The mean age of the children was 9.0± 2.6 years. The majority (71%) of children were in the 5–10 year age group. The male/female ratio was 1.2:1. 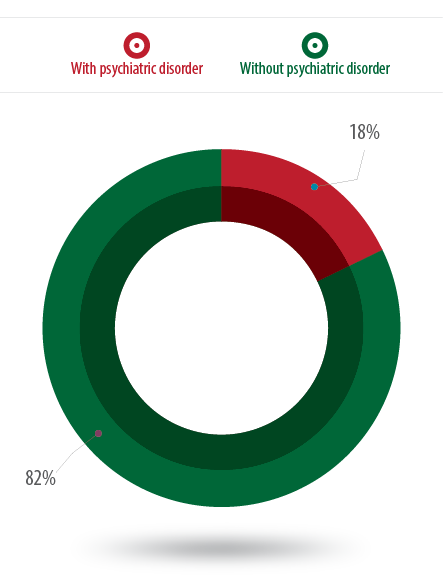 Among the respondents, 18% were found to have a psychiatric disorder. Behavioral disorders, emotional disorders, and developmental disorders were found in 9.0%, 15.0% and 0.4% respectively. Hyperkinetic disorder was the single most frequent (5.0%) psychiatric disorder. Conclusions: A significant number of children were found to have psychiatric disorders. Our study indicates the importance of identification and subsequent management of psychiatric conditions among the pediatric population. Child and adolescent mental health services are limited throughout the globe. Recent data from the WHO Mental Health Atlas (2005) found that the need for child and adolescent mental health services are not fully met anywhere in the world.10 The scenario is comparatively worse in developing countries, including Bangladesh, and a massive gap exists between need and service provision. Child psychiatric disorders often present in the context of somatic symptoms and are more common among frequent practice attendees.11 It was also found that psychiatric disorders are more common in children with chronic and acute pediatric disorders.12,13 As a result, child mental health problems are common reasons for consultation in general pediatric clinics. The result of a recent study showed that 20% of children attending pediatric OPDs had suffered from a psychiatric disorder.14 Moreover in developing countries, families may not appreciate, or children may not be able to express, psychological distress and may somatize their symptoms. Children and adolescents and their care-takers hesitate to seek help from mental health professionals; rather they prefer pediatric medical settings for treatment and support. This study was designed to ascertain the proportion and pattern of psychiatric disorders at the pediatric OPD of three prime tertiary level hospitals of Dhaka, Bangladesh. The information will help to define needs and priorities of this patient group. It will also help to integrate the pediatric and child psychiatric service to deal with such patients more effectively. This cross-sectional study was conducted between July 2012 and February 2013 in the pediatric OPD of three tertiary level hospitals of Dhaka, Bangladesh. These were the Combined Military Hospital (CMH), Bangabandhu Sheikh Mujib Medical University (BSMMU) Hospital, and Dhaka Medical College Hospital (DMCH). The purposive sampling technique was used and a sample size of 240 was taken. Data for 80 male and female patients aged 5 to 16 years were taken from each hospitals. Children and adolescents with impaired consciousness, very severe physical illness, and not accompanied by parents/guardians were excluded. Informed consent was taken from the parent/guardian. A semi-structured questionnaire containing sociodemographic and other relevant clinical information and the parent version of the Development and Well-Being Assessment (DAWBA) in Bangla were applied to the consented parents or caregivers. DAWBA is a validated and internationally well-accepted research instrument that contains a novel package of questionnaires, interviews, and rating techniques designed to generate International Statistical Classification of Diseases and Related Health Problems 10th Revision (ICD-10) psychiatric diagnoses among children and adolescents aged 5 to 18 year olds (and has been extended up to 18 years).15 The self-version of DAWBA is applicable only for children ≤ 11 years, but this study looked at children aged 5 to 16 years old. Therefore, for uniformity and convenience, only the parent version was used in this study. This instrument has been translated in Bangla and standardized and validated by Mullick and Goodman.8 DAWBA was administered as an interview with parents and verbatim accounts of any reported problems were recorded. The supervisor of the study who is an international rater and validator of DAWBA, subsequently reviewed both the verbatim accounts and the answers to structured questions, and did the clinical rating before assigning diagnoses according to ICD-10 criteria. Thus, a specific diagnosis was reached through DAWBA. Ethical clearance was obtained from the ethical clearance committee of the concerned authorities of hospitals. Data analysis was performed using computer software program SPSS Statistics (SPSS Statistics Inc., Chicago, US), version 15.0 for Windows. Data was presented by frequency distribution, graphs and tables, and appropriate statistical tests (chi-square test) were performed. Table 1: Sociodemographic characteristics of the study population (n = 240). A total of 240 children and adolescents aged 5 to 16 years attending the pediatric OPD were included in the study. The mean age of the respondents was 9.0±2.6 years. The majority (70.8%) of children were aged 5 to 10 years old [Table 1]. Over half of the children were male (54.2%) and the male/female ratio was 1.2:1. The majority (79.2%) of children were in primary level education, 13.7% were in secondary education, and 7.1% were illiterate. Most children (74.2%) resided in urban areas and had a middle socioeconomic status (51.7%). Most were Muslim (97.5%). Sociodemographic variables were not associated with the presence of psychiatric disorder (p > 0.050). 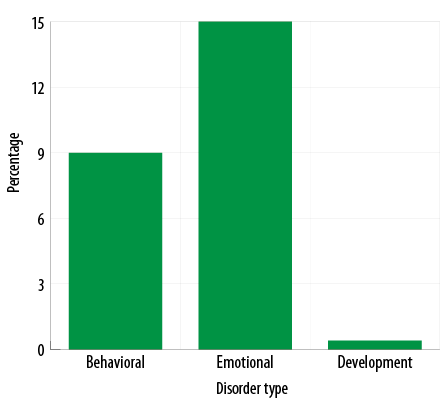 Figure 1: Proportion of psychiatric disorders among the respondents (n = 240). Figure 2: Psychiatric disorders of the respondents in the three hospitals (n = 240). Figure 3: Proportion of main categories of psychiatric disorders (n = 240). Table 2: Types of psychiatric disorders among the study population (n = 240). Psychiatric disorders were found in 18% of the study population [Figure 1]. 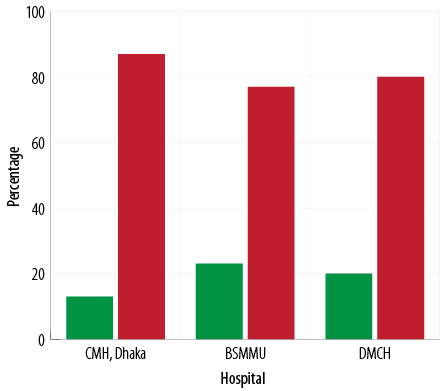 Among them, 13%, 23%, and 20% of children and adolescents were from CMH Dhaka, BSMMU, and DMCH, respectively [Figure 2]. Behavioral disorders made up 9% of the overall disorders, emotional disorders were 15%, and developmental disorders were 0.4% [Figure 3]. Hyperkinetic disorder was the most frequent (5%) psychiatric disorder [Table 2]. Out of the 240 patients in the pediatric OPD, 44 were found to exhibit psychiatric disorder making the overall proportion of psychiatric disorder 18%. The result is comparable to rates (20%) obtained in previous studies.14,16,17 However, our result is lower than that of a previous UK study (28%)18 but is higher than studies by Goldberg et al (1–8% and 5%).19,20 This inconsistent finding might have been due to different diagnostic criteria (ICD-9) and different study methodologies (pediatricians did the diagnoses of the diseases of those studies). It could be speculated that the proportion of psychiatric disorder would be higher in a pediatric OPD where more sick children attend with physical symptoms and chronic illness. However, our finding is almost equal with the overall prevalence of child and adolescent psychiatric disorder (11–21% and 18.4%) in Bangladesh.8,9 This may be due to the selection of tertiary hospitals of Dhaka city. Another reason may be the use of the DAWBA, which primarily focuses on the common emotional, behavioral, and hyperactivity disorders and covers less common disorders in children and adolescents more briefly. While comparing the proportion of psychiatric disorders among three hospitals, a lower prevalence (13%) was found in CMH compared to the other two hospitals (23% in BSMMU and 20% in DMCH). A possible reason for this is that as a tertiary hospital CMH has a good screening system of patients at its primary level by qualified doctors who usually identify the probable psychiatric cases and refer them to psychiatric OPD. In our study, the overall proportion of emotional disorder was the highest (15%) among all psychiatric disorders. Other studies also reported similar results.11,14,18,21 Hyperkinetic disorder was 5% in this study, lower than findings (8%) of older studies.18,20 On the other hand, the rate is much higher than the overall prevalence (1%) of hyperkinetic disorder in Bangladesh.9 This may be due to the urban predominance of the respondents who were more exposed to risk factors (like parental expectations, attitudes to and tolerance of behavior, adverse social condition, academic pressure, lead exposure, and certain food additives). The next common diagnosis was oppositional defiant disorder (ODD) (3%), and CD was found in 1% of respondents. The result is compatible with the overall prevalence rate (1% for each disease) of Bangladesh,9 but is lower than the findings of other studies, which reported a rate of 2.9% and 14% for CD, respectively.8,18 Mullick and Goodman8 also reported a prevalence of 5.9% for ODD, which can be explained by the study location, a slum area. In slum areas, children and adolescents might be more vulnerable to social threats such as a lack of parental support, low socioeconomic status, and easy access to crime. The depicted lower prevalence of psychiatric disorders in our study may also be due to the ignorance of the family members to recognize the symptoms of ODD or CD as illness. For example, behavioral disorders were noticed less by the parents and caregivers and may not be considered as disorder for getting medical support. Obsessive-compulsive disorder (OCD) was found in 2.5% of the respondents in our study. This figure is similar to other studies within the same culture that were performed in different settings.8,22 The preponderance of somatoform disorder, which were observed in 1.7% of the study participants, was consistent with the overall prevalence rate in Bangladesh (2%).9 Generalized anxiety disorder was under-represented (0.4%) probably due to the lack of awareness and ignorance about mental health. The low percentage of autistism spectrum disorder (0.4%) in this study was also found in other studies in Bangladesh.8,9,23 It is possible that parents do not consider that autistic children have a psychiatric disorder. It seems that the pattern of diagnosis does not match up to an extent with the western studies due to culture variation and other factors like ignorance, lack of awareness, and social stigma. The study was conducted in three selected tertiary hospitals of Dhaka city with relatively small sample size. The study population was not representative of the whole child and adolescent population, which may limit the generalization of the results. This study indicates that a significant number of children attending the pediatric OPD of general hospitals in Bangladesh have psychiatric disorders. Psychiatric disorders are frequent in pediatric OPD as they are associated with enhanced reporting of physical symptoms. Our results suggest the need for effective hospital-based pediatric–psychiatric liaison services, which will improve early identification through screening, appropriate referral, and subsequent management. Further in-depth research should be carried out to address the issue. The authors would like to thank the heads of the departments of pediatrics of the three concerned hospitals. They were kind enough to allow us to conduct this research in the outpatient departments of their respective institutions. Special thanks to the participating parents and administrative staffs of the concerned institutions for the help and cooperation they provided during the data collection that made this work possible. 1. Murray RM, Kendler KS, Mcguffin P, Wessely S, Castle DJ. Essential Psychiatry. 4th Edition. Cambridge: Cambridge University Press; 2008. p.97. 2. Belfer ML. Child and adolescent mental disorders: the magnitude of the problem across the globe. J Child Psychol Psychiatry 2008 Mar;49(3):226-236. 3. Hackett R, Hackett L. Child psychiatry across cultures. Int Rev Psychiatry 1999;11:225-235. 4. Younis MS, Al-Noaimi AS, Zaidan ZA, Al-Rubayie AF, Al-Farsi Y, Al-Zakwani I, et al. Clinical and Demographic Profile of Attendees at Baghdad’s Walk-in Psychiatric Clinic. Oman Med J 2013 Sep;28(5):365-370. 5. Bangladesh Bureau of Statistics. Statistical Pocketbook of Bangladesh, 2010;88. 6. Mullick MS, Khanom M, Islam H. Psychiatric morbidity of outpatient children in institute of mental health and research. Bang J Psychiatry 1995;7(1):4-8. 7. Mullick MS, Goodman R. Questionnaire screening for mental health problems in Bangladeshi children: a preliminary study. Soc Psychiatry Psychiatr Epidemiol 2001 Feb;36(2):94-99. 8. Mullick MS, Goodman R. The prevalence of psychiatric disorders among 5-10 year olds in rural, urban and slum areas in Bangladesh: an exploratory study. Soc Psychiatry Psychiatr Epidemiol 2005 Aug;40(8):663-671. 9. Rabbani MG, Alam MF, Ahmed HU, Sarkar M, Islam MS, Anwar N, et al. Prevalence of mental disorders, mental retardation, epilepsy and substance abuse in children. Bang J Psychiatry 2009;23:11-52. 10. World Health Organization. Atlas: child and adolescent mental health resources: global concerns, implications for the future. Geneva: World Health Organization 2005. p.16. 11. Jezzard RG. Child and adolescent psychiatric disorders in general practice. Adv Psychiatr Treat 1995;1:184-191. 12. Gledhill J, Rangel L, Garralda E. Surviving chronic physical illness: psychosocial outcome in adult life. Arch Dis Child 2000 Aug;83(2):104-110. 13. Judge D, Nadel S, Vergnaud S, Garralda ME. Psychiatric adjustment following meningococcal disease treated on a PICU. Intensive Care Med 2002 May;28(5):648-650. 14. Glazebrook C, Hollis C, Heussler H, Goodman R, Coates L. Detecting emotional and behavioural problems in paediatric clinics. Child Care Health Dev 2003 Mar;29(2):141-149. 15. Goodman R, Ford T, Richards H, Gatward R, Meltzer H. The Development and Well-Being Assessment: description and initial validation of an integrated assessment of child and adolescent psychopathology. J Child Psychol Psychiatry 2000 Jul;41(5):645-655. 16. Briggs-Gowan MJ, Horwitz SM, Schwab-Stone ME, Leventhal JM, Leaf PJ. Mental health in pediatric settings: distribution of disorders and factors related to service use. J Am Acad Child Adolesc Psychiatry 2000 Jul;39(7):841-849. 17. Costello EJ, Costello AJ, Edelbrock C, Burns BJ, Dulcan MK, Brent D, et al. Psychiatric disorders in pediatric primary care. Prevalence and risk factors. Arch Gen Psychiatry 1988 Dec;45(12):1107-1116. 18. Garralda ME, Bailey D. Psychiatric disorders in general paediatric referrals. Arch Dis Child 1989 Dec;64(12):1727-1733. 19. Goldberg ID, Regier DA, McInerny TK, Pless IB, Roghmann KJ. The role of the pediatrician in the delivery of mental health services to children. Pediatrics 1979 Jun;63(6):898-909. 20. Goldberg ID, Roghmann KJ, Mclnerny TK. Burke JD, Jr. Mental health problems among children seen in pediatric practice: prevalence and management. Pediatr. 1984;73(3):278-293. 21. Sayal K, Taylor E, Beecham J. Parental perception of problems and mental health service use for hyperactivity. J Am Acad Child Adolesc Psychiatry 2003 Dec;42(12):1410-1414. 22. Pillai A, Patel V, Cardozo P, Goodman R, Weiss HA, Andrew G. Non-traditional lifestyles and prevalence of mental disorders in adolescents in Goa, India. Br J Psychiatry 2008 Jan;192(1):45-51. 23. Alam MF, Hasan N, Ali M, Azad MC, Bashar K, Akhter F, et al. Multi-axial diagnoses of child and adolescent psychiatric disorders in inpatient department of National Institute of Mental Health, Dhaka. Bang J Psychiatry 2004;18(2):55-65.